Thanks to our patrons, over $11,600 has been raised for the library and other charities over the last six years of the tree. Created entirely from withdrawn books, the 6 ft. tree is a volunteer project by Joseph F. Smolinski and an annual fundraiser. What a wonderful way to honor your family or loved one, and your donations will support Fredricksen Library. For a donation in the amount you choose (minimum $10), patrons can have a name or family name placed on the spine of a book for the 2018 holiday season. Dedications available November 5 through December 19. Holiday cards will be available at the library for you to send to the recognized person or family if desired. And watch for YOUR dedications on facebook and instagram. Forms will be available at the Reference and Circulation Desks, OR make your dedication request ONLINE! SEE THE 2018 DEDICATIONS ON THE TREE! LIBRARIES & OTHER NON-PROFITS - DOWNLOAD A STEP-BY-STEP INSTRUCTION BOOKLET HERE TO REPLICATE THIS HOLIDAY PROJECT FOR YOUR ORGANIZATION. 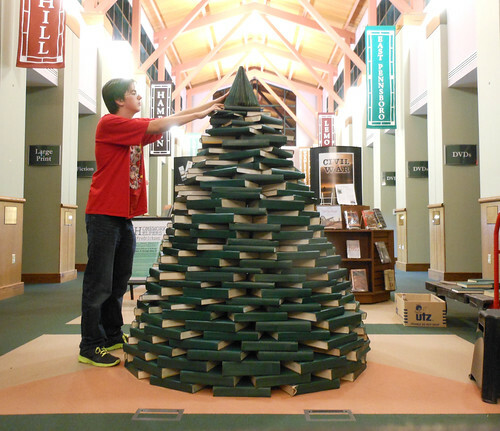 See photos and video of the creation of the FIRST year (2013) of the Holiday Book Tree HERE or CLICK below!